Comments: The Jacobs 144 is not very commonly found. The J-144 lacks the manual crank handle that some of the smaller models utilize. 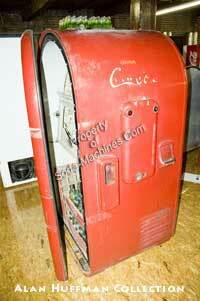 The soda vends once the correct change is inserted into the coin slot. This is the first machine that Jacobs produced and their largest too.